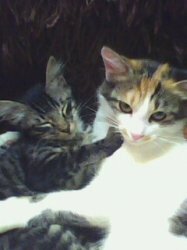 We have two cats, Pixie (Female 14 months) and Buzz (Male 6 months). They are self entertained and easy to handle. We are looking for a loving family who will care for the cats like their own. As my mother is asthmatic, it is becoming hard because she is allergic to cat hair.